The first Council in Thirsk came into being as Thirsk Parish Council in December 1894 as a result of the Local Government Act of that year. The Local Government Act of 1972 gave Parish Councils the opportunity to change titles and Thirsk opted for its present title of Thirsk Town Council. This change meant that the Chairman became the Mayor. Thirsk Cemetery, public amenity areas and open spaces including The Holmes, Castle Garth, riverside picnic areas, Mill Gardens and St James Green, 8 play areas The Market Place Clock, St Mary's Church clock and floodlights, the Market Place bus shelter, notice boards, plaques and interpretation boards, plinths and various planters, White Mare roundabout, public seats, the Christmas tree and surrounding lights. To prevent the closure of Millgate public toilets and provide facilities to help maintain Thirsk as a successful tourist attraction the Town council has taken over the toilets from Hambleton District Council. 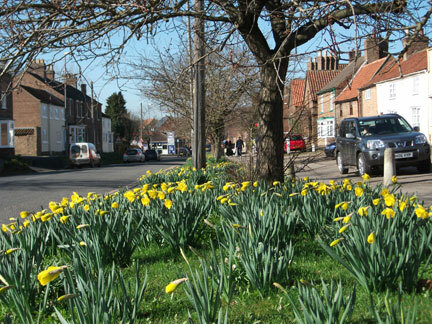 The Town Council contributes to the running of the Town Hall, maintenance of Thirsk and Sowerby Flatts, the Millennium Green and Carrs Field and makes small grants to voluntary and charitable bodies.